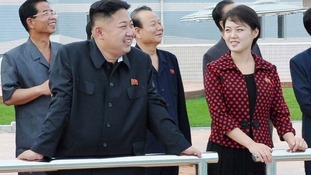 So it appears North Korea has a new first lady: Ri Sol Ju. Named as the new wife of Kim Jong Un; the twenty something leader of the world's most secretive state. Her identity was a mystery for the last two weeks, ever since she was spotted at a concert which featured Disney characters earlier this month. Was she a sister or a girlfriend? There was speculation she was a pop singer famed for her top hit entitled 'Excellent Horse Like Lady'. A video on You Tube features the video for the song set in a textile factory. South Korean media claims that Ri Sol Ju, is 27 and a top scoring university graduate; hand picked by Kim's uncle to be the leader's spouse. So the world's only Communist dynasty has a chance of continuation. It's been noticeable that Kim and his wife have been seen in a lot of recent photo opportunities at schools and kindergartens. Photos released today by the North Korean State News Agency show the happy couple touring a new amusement park, admiring the mini golf course. It was rare for his father Kim Jong Il to appear alongside a wife. He is reputed to have had four wives or consorts. Could Ri Sol Ju's public appearances be part of a PR drive to try to present a warmer, more family orientated image of the North Korean leadership, even if Kim Jong Un controls a country trapped in the cold war.